Caution - this is not an itinerary for novices. Consult up-to-date nautical charts, tide and current tables, and sailors with local knowledge before attempting this trip. Day 1: Traverse the East River from Long Island Sound timing the tide to arrive at Battery Park at slack water so the tide is turning up into the Hudson at that time…that means leaving LIS slightly after the tide turns. Hell Gate is the tricky part where the river curves and boils with a vicious current and swirling eddies. It is, however, well marked and if you time the tides properly, it is not a problem and a very enjoyable trip. Where else can you sail in the shadow of the world’s largest city beside looming skyscrapers and under massive bridges? One of those bridges, however, is a low one and if the Coast Guard closes the western channel around Roosevelt Island to protect the United Nations building, you’ll have to traverse the eastern approach and wait for the bridge opening. Contact the bridge tender on channel 13. You’ll be gaping at the sights all the way on your first trip. Seeing the river from the FDR is nothing like seeing the city from the river. It is totally awesome and mesmerizing. New York harbor certainly gets a lot of traffic and contrary to what you may think, a lot of sailboat traffic. 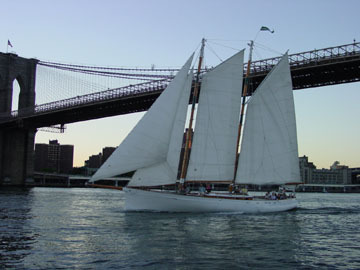 You may find yourself in the middle of a small boat regatta out of Manhattan Sailing Club or sailing along with a visiting tall ship. It won’t be boring. Plan your stay in advance for the greatest enjoyment potential. On a private mooring in lower Manhattan looking toward NJ. Be prepared for a rocky night as the river traffic never stops and the city doesn't sleep. It's an amazing experience. 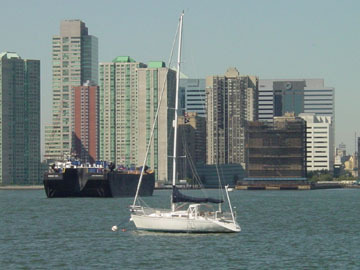 Slips available at Chelsea Piers http://www.chelseapiers.com/marina.htm and possibly at Manhattan Yacht Club http://www.myc.org/  these are the most convenient locations for exploring the city but very expensive in comparison. Both locations get mainly mega power yacht traffic. 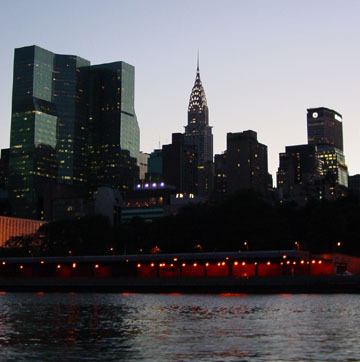 The skyline from the East River at dusk. Chrysler Building at center. Take a leisurely trip across the Upper Bay through the Verrazano Narrows and across the Lower Bay to Sandy Hook . You’ll have a totally different experience here. The entrance to Sandy Hook is a little tricky, again with tides and currents running amuck at the entrance to the bay. 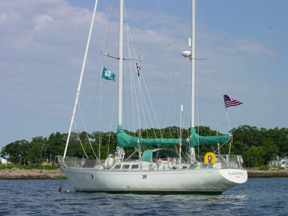 There is a large anchorage inside the “hook”. Visit the beaches at the state park, go fishing in the teeming channel, or stroll the charming town of Atlantic Highlands at the head of the Bay. Return to LIS timing the tides, again leaving just at slack water at the Battery to work your way up the East River on the flood. Once again be sure to check for any Coast Guard restrictions on transiting this important waterway. For a narrative description of the LIS to NY Harbor transit down the East River, click here.